All eyes were on Burberry and creative director Christopher Bailey Monday night as London Fashion Week reached its starry climax. Bailey didn’t disappoint, drawing on the sculptor Henry Moore for inspiration in a startling new collection that built on the English heritage brand’s traditional appeal. The Burberry spectacle capped four days of shows that highlighted London’s claim to be an international fashion hub that rivals Paris, Milan and New York. 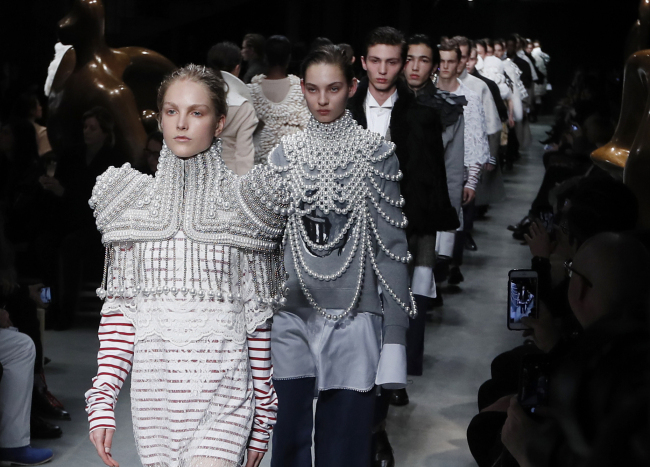 No fashion house pays as much attention to English heritage as Burberry, which paid homage to the late English sculptor Henry Moore with the autumn and winter collection unveiled to a packed house Monday night. The catwalk space was adorned with some of Moore’s outsized sculptures and guests were treated to a display of his drawings before the show. Bailey said he sought to make the clothes three-dimensional and textured much like Moore’s sculptures -- which look smooth from a distance but are actually textured and detailed when viewed up close. He told the Associated Press he used the color palette that Moore often wore when he worked and pointed proudly to one of Moore’s striped work aprons on display behind glass at the Burberry Makers House in London’s Soho neighborhood. “Henry Moore has been a huge influence on me my whole life,” Bailey said of the sculptor known for his monumental works. Bailey said the sculptural shapes of the collection were taken from Moore, as was the lacing he used on many pieces. The stripes came from Moore’s apron, and the rope motif -- seen by some as nautical -- came from the abstract shapes Moore created with ropes. Burberry has for several years shunned the recorded music heard at many shows in favor of live performances. Monday’s show was enlivened by English singer-songwriter Anna Calvi, backed by her band and the Heritage Orchestra and Choir. One of London’s favorite designers, Christopher Kane, mixed new technology with tried-and-true craftsmanship to produce a stellar show Monday at the Tate Britain museum. Kane used space-age techniques, including holographic foiled lace and iridescent full-print knits, along with a traditional weaving process from the early days of mechanization. Most striking was the use of a Gainsborough silk reworking of a French damask from the 18th century that was styled into very contemporary dresses. Kane’s approach gave the outfits an old-meets-new mystique, and the use of Asian motifs, including billowing silk prints, expanded his range. Triangular shapes appeared on the front of many dresses and Kane made good use of the pink floral theme that has been popular in shows this year. “We wanted to express a tougher femininity this season,” said Kane. “(I was) looking at abstract shapes, hard angles, and sharp jags” inspired in part by female factory workers. The Erdem show at the Old Selfridges Hotel showed a remarkable unity of vision despite a wide range of colors, fabrics and mood. Canada-born designer Erdem Moralioglu focused almost entirely on long, tightly fitting, ultrafeminine dresses. Instead of exposing wide swaths of his models’ flesh, as other designers are doing, he chose to emphasize the female form in its entirety, only rarely choosing to unveil a hint of cleavage. Most of the outfits featured high necks and long sleeves with elaborate detailing, intricate beadwork and delicate embroidery. Oversize coats or high boots seemed to explode with color. The beauty was in the detailing, which gave each piece an individual feel.